We have been learning about descriptive writing and adjectives this term. We thought up lots of adjectives (describing words) for people and then we chose some words off the list to write acrostic poems about ourselves using the letters in our names. 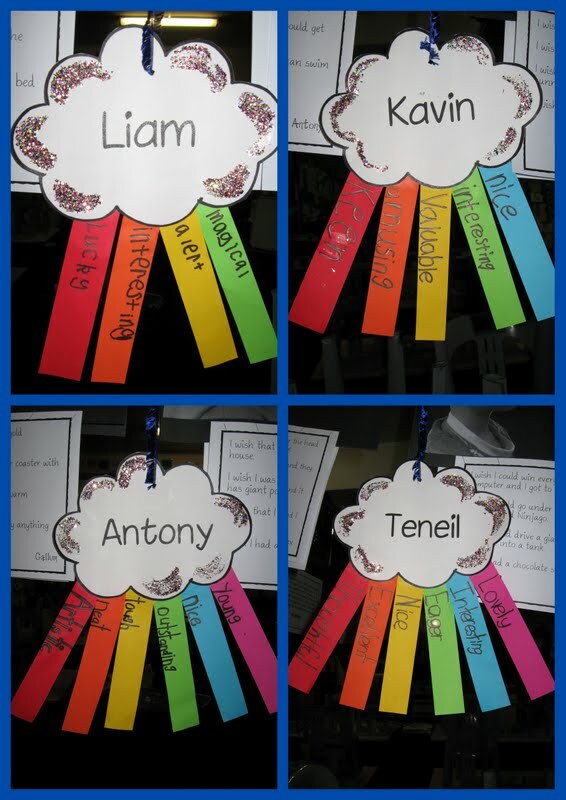 We published them on rainbow clouds to make "Namebow" poems. Don't the look lovely and bright hanging in our classroom? 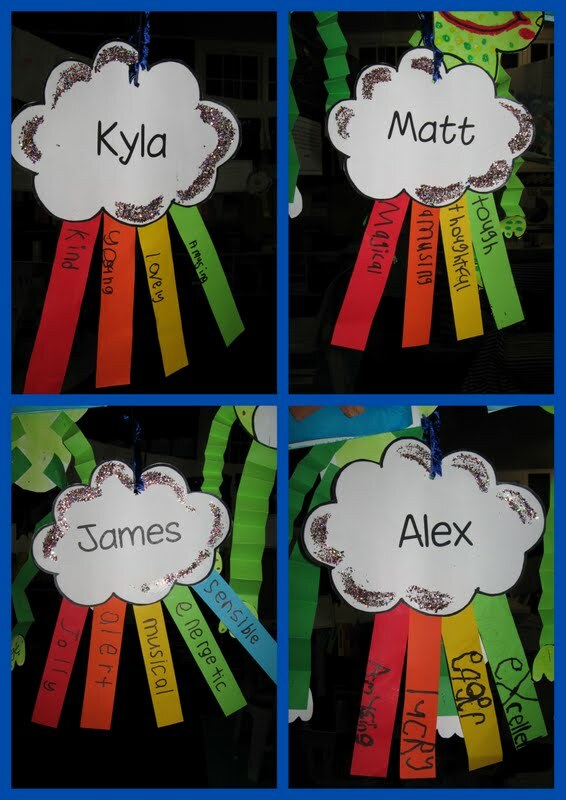 Come into B4 and take a look at the rest of our colourful namebows! Hi B4 Bright Sparks. I LOVE your namebows! They are so bright and colourful. I love how you added glitter to them to make them sparkle and shine, just like you all do! Your describing words are all so interesting and what a clever idea to choose some adjectives that start with the letters in your name. I love walking past your classroom windows and seeing them! Hello from Room 1 at Westbrook Primary in Rotorua. My class loved watching the video of your folk dancing day. We had a Year 1 and 2 Concert at the end of Term 3. Room 1 did the same carnivalito dance and Room 2 did the Mexican hat dance. The room 1 children got very excited when they saw their dance being done by some one else. We did Carnivalito a litle bit different.The boys wore black pants and white shirts with silver waist coats and the girls wore bright swishy twirly skirts.We twirled ribbons as we danced. Congratulations on your wonderful dancing. from Mrs. Lee ( Mrs. Harringtons Mum and Room 1 at Westbrook Primary.